What if you aren't the Chosen One? The one who's supposed to fight the zombies, or the soul-eating ghosts, or whatever the heck this new thing is, with the blue lights and the death? What if you're like Mikey? Who just wants to graduate and go to prom and maybe finally work up the courage to ask Henna out before someone goes and blows up the high school. Again. Because sometimes there are problems bigger than this week's end of the world, and sometimes you just have to find the extraordinary in your ordinary life. Even if your best friend is worshipped by mountain lions. 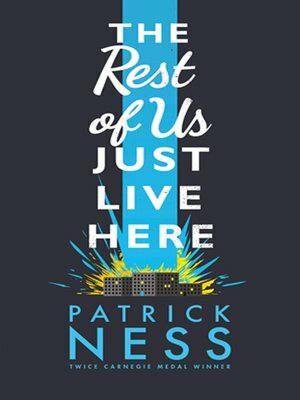 Award-winning writer Patrick Ness's bold and irreverent novel powerfully reminds us that there are many different types of remarkable About the author Patrick Ness, an award-winning novelist, has written for England's Radio 4 and Sunday Telegraph and is a literary critic for The Guardian. He has written many books, including the Chaos Walking Trilogy, The Crash of Hennington, Topics About Which I Know Nothing, and A Monster Calls. He has won numerous awards, including the Guardian Children's Fiction Prize, the Booktrust Teenage Prize, and the Costa Children's Book Award. Born in Virginia, he currently lives in London.